Another new card from Hearthstone's upcoming expansion, The Boomsday Project, has been revealed. 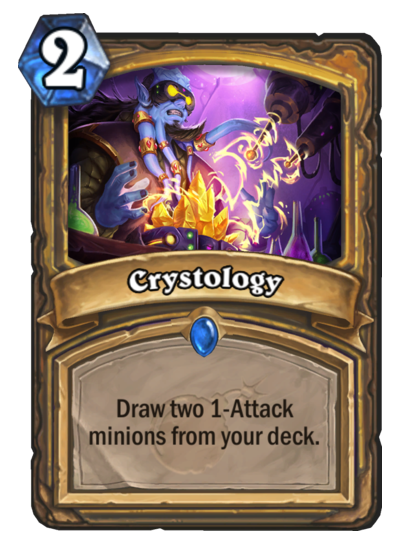 Crystology is a two-mana Paladin spell that allows you to draw two minions with one attack from your deck. Naturally, Paladins have access to Silver Hand Recruits—but that's not the type of one-attack minion you'll want to draw with Crystology. Some Paladin minions that this card could combo well with include Righteous Protector, Drygulch Jailor, Bolvar, Fireblood, Lynessa Sunsorrow, and Primalfin Champion. But Crystology could also be used to draw some powerful neutral minions that help promote the aggressive Paladin archetype, such as Abusive Sergeant, Argent Squire, and Dire Mole. Crystology isn't the only new Paladin spell coming in The Boomsday Project, however. Kangor's Endless Army will be this archetype's legendary spell, which is a new rarity for spells in Hearthstone. The Boomsday Project is the second Hearthstone expansion of the current Standard year, the Year of the Raven. The set will add 135 new cards to the game, including new keywords like Magnetic. Hearthstone players can already preorder this expansion—and all of the cards will be available on Aug. 7.